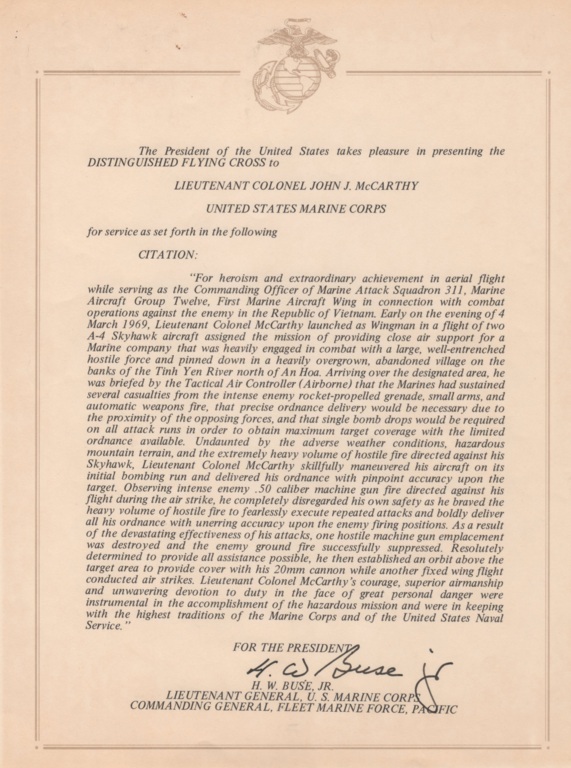 United States Marine Corps Lieutenant Colonel John “JJ” McCarthy started his military career as a submariner. 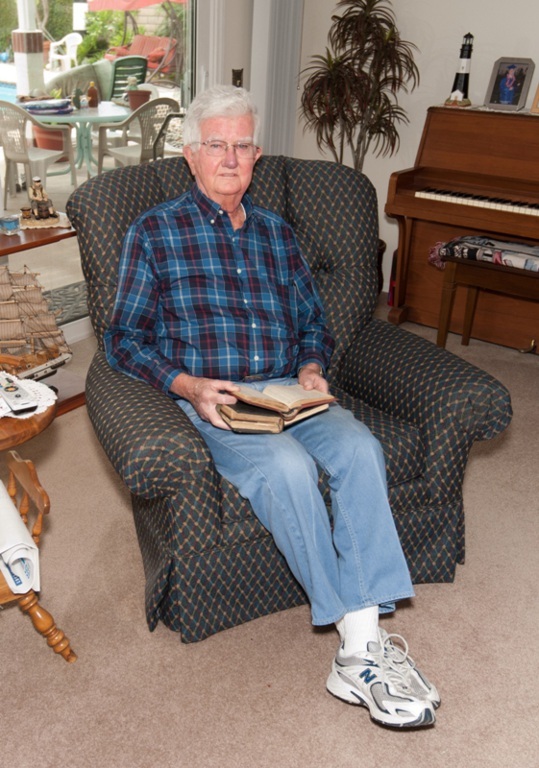 In 1946, a seventeen year old John McCarthy enlisted in the United States Navy. After boot camp he scored high enough on a military test for Submarine School in New London, Connecticut and was later assigned to the U.S.S. Bergall (SS320) as a Diesel Engine Mechanic and later a Sonar Technician. 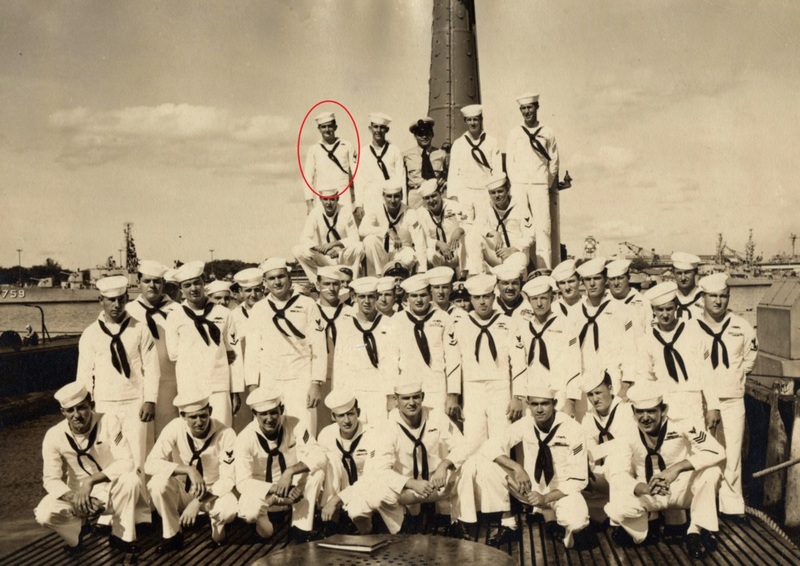 A 20 year old Submariner, Seaman McCarthy poses with the crew of the U.S.S. Bergall (SS-320) in Pearl Harbor in June 1949. While assigned as a submariner, JJ enrolled in Temple University, in Philadelphia, Pennsylvania in 1949 and four years later graduated with a degree in Dairy Technology. Seaman McCarthy wanted to be a naval aviator, but at almost 26 years old, the Navy wasn’t able to give him a commission due to his age. Not taking “no” for an answer, John found that the Marine Corps was more than happy to give an aging submariner a commission! In November 1952, Second Lieutenant McCarthy began Naval Flight School in Pensacola, Florida and graduated in 1954. 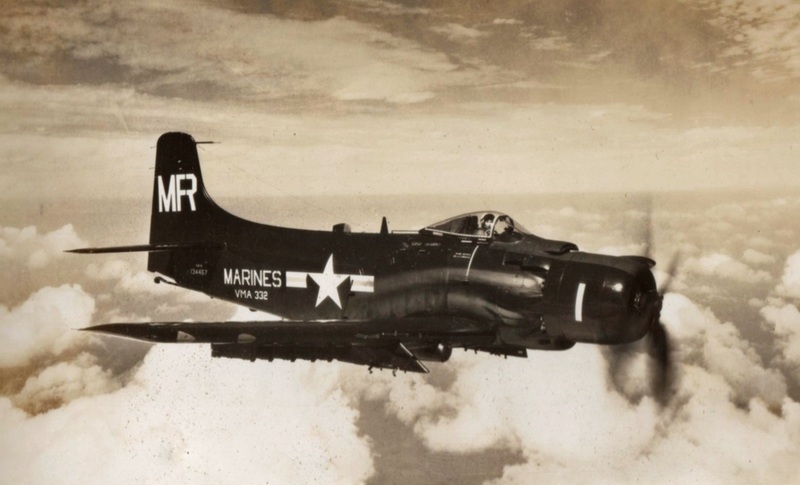 His first assignment was with VMA-332 Tophats stationed at Marine Corps Air Station Miami (now known as Opa-locka airport) flying the AD-1 Skyraider. 2nd Lt JJ McCarthy flying a routine training mission in a VMA-332 A-1 Skyraider (1954). The Skyraider’s primary mission was close air support (CAS) and the Tophats trained for that mission. McCarthy recalls that they would conduct dive angles that would be in excess of 70 degrees! On one of his first training sorties, John remembers smoking a cigar while on his flight. He entered into his bombing run, which was literally straight down. When he pulled out at the bottom of his bomb run and due to the 4.5Gs he pulled, his cigar went half way down his throat! Needless to say, Second Lieutenant McCarthy quickly realized, as he pulled the cigar from his throat, that although it looked very cool, smoking while piloting wasn’t such a great idea! In 1956, McCarthy rotated out of VMA-332 and was originally slated for a C-119 transport squadron. JJ made a request through his chain of command, as he described, that he was an attack pilot, not a transport pilot! Second Lieutenant McCarthy was subsequently told that was the only flying assignment available and if he didn’t want to fly the “Flying Boxcar” (nickname for the C-119) he would be assigned to a non-flying land based job as a Forward Air Controller (FAC). 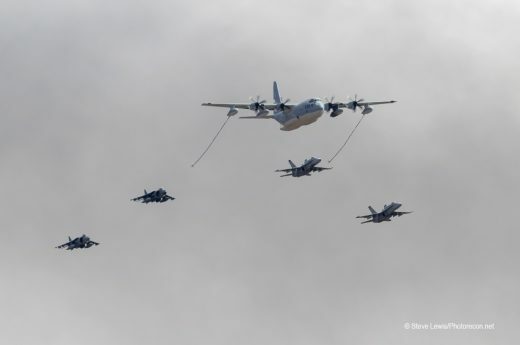 The job of a FAC is to coordinate the air assets with ground assets during close air support missions. FACs aid close air support pilots in identifying enemy targets, as well as the location of friendly forces. FAC can be air or ground based, and in the case of attack pilot Second Lieutenant John Joseph McCarthy, it was the latter. JJ spent almost a year at Camp Lejeune, North Carolina before he was assigned his next unit – H&MS-12 Maintenance Squadron, Iwakuni. Japan. During his tour at Iwakuni, JJ had several different assignments, which included being the maintenance officer for several different squadrons. The benefit of this assignment was that now First Lieutenant McCarthy had access to flying the aircraft from these squadrons. These aircraft included AD-1s, SNBs, C-119s, R-5ds, TB2s, and F-80s. In addition to the maintenance officer, McCarthy served as the aid to the Deputy Wing Commander – General Ralph Rottet. Up to this point in First Lieutenant McCarthy’s career, he had approximately five years in piston driven aircraft. He had not yet received an assignment that allowed him to fly the latest technology in military aviation – The Jet! That was soon to change. In 1959, McCarthy was assigned to the three month stint in Jet Transitional Training Unit (JTTU) at Naval Air Station Olathe, Kansas; he flew the Grumman F-9F-8T Cougar (a two seat trainer version of the F-9F Cougar). I asked Lieutenant Colonel McCarthy what was the biggest transitional obstacle he faced while in “jet school?” He told me other than the obvious one (increased power), it was the lag time when you applied power. 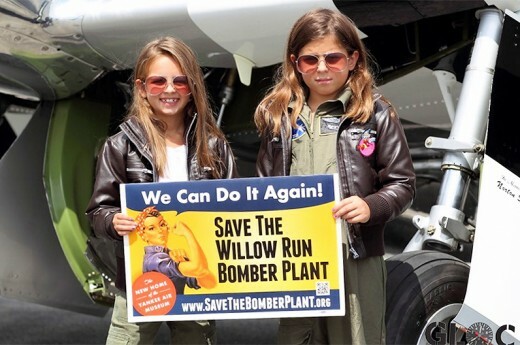 There was a second or two delay when you added power to a jet engine as opposed to the instantaneous power response of piston driven aircraft. Also, due to the increase speeds of jet aircraft (and less reaction time) a pilot had to have superior “SA” or situational awareness. In 1959, newly promoted Captain McCarthy was assigned to his first jet aircraft squadron VMA-225 the Vagabonds at Marine Corp Air Station Cherry Point, North Carolina. This was the beginning of a thirteen year relationship that Captain McCarthy had with one of the Marine Corps newest attack platforms – the Douglas A-4 Skyhawk (aka Scooter). The Skyhawk was designed to replace the piston driven AD-1 Skyraider. One of the many capabilities of the Scooter was that it was a nuclear delivery platform. 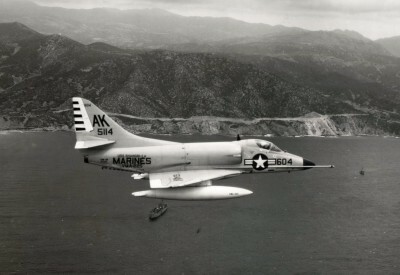 The Marine Corp took delivery of the Skyhawk in January 1957 and it remained in service until 1993. 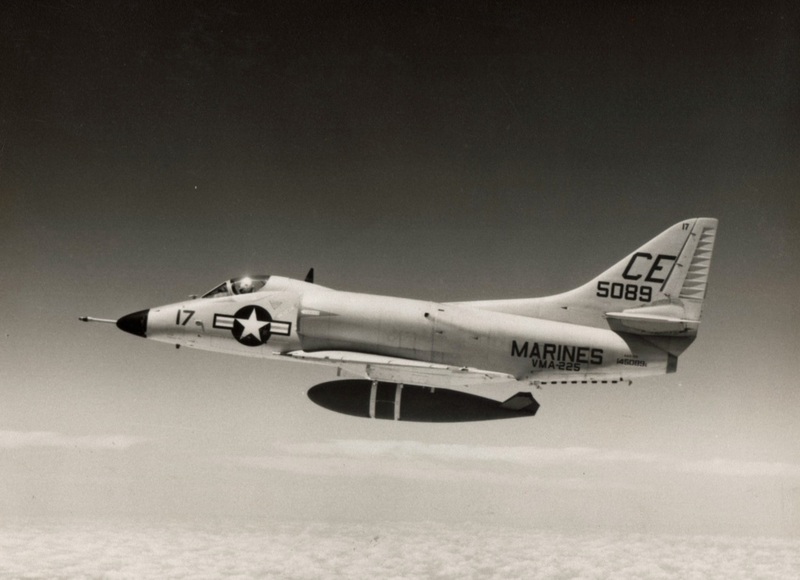 As a Vagabond (VMA -225), Capt McCarthy flew the Douglas A-4 Skyhawk based at MCAS Cherry Point, NC (February 1960 - November 1961). John (at six feet tall) told me the cockpit of the A-4 was extremely tight. In order to reach the right side of the cockpit, he had to use his left hand and vice versa. Other than that, he said the Scooter was an incredibly reliable and durable aircraft that brought him home safe more than once! 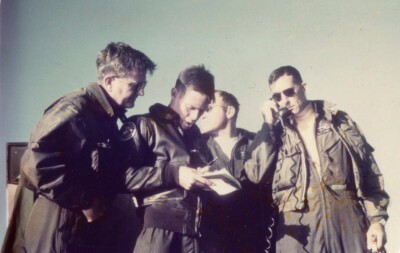 While with the Vagabonds, McCarthy was certified as an A-4 nuclear delivery pilot, served as the squadron’s safety officer, and became a Landing Signal Officer (LSO). Captain JJ McCarthy deployed on his first tour on an aircraft carrier in 1961. Still a member of VMA-225, McCarthy set sail for the Mediterranean on the U.S.S. Shangri-La (CVS-38). Once in the Mediterranean Sea, Captain McCarthy remembers conducting normal carrier qualifications, aircraft proficiencies, acting as an LSO, and sitting alert in his Skyhawk. Over the coast of Greece on April 18, 1961 (12 days after going over the side of the U.S.S. Shangri-La). In 1961, the Cold War between the United States and Russia was at a peak. Carrier pilots, much like their United States Air Force counterparts in the Strategic Air Command, routinely sat alert, in the event of a Soviet attack. JJ and his fellow carrier aviators participated in these alerts armed with “special weapons.” John told me in the event he and his fellow aviators were launched, he knew it “was a one way ride.” He had his classified targets, initial points (IPs), and ingress and egress routes. He added that in those days your only hope for survival meant you were able to successfully launch your weapon and/or weren’t shot down, was to look for a coal mine to eject nearby. The coal mines provided lead protection from the nuclear blast wave. Another first for Marine Corps aviator Captain McCarthy happened after he successfully landed after a routine day time flight training flight on April 6, 1961. The problem arose when John throttled forward to re-orient the A-4’s nose wheel and then tried to power back to idle and couldn’t! 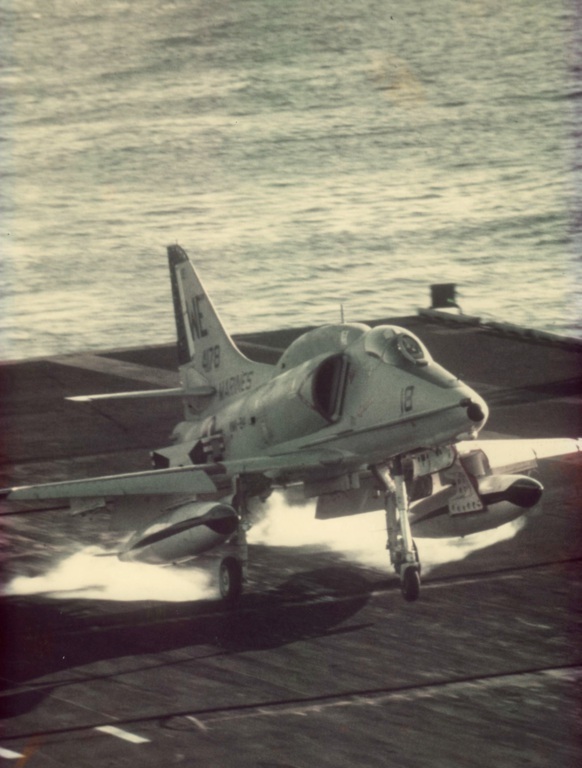 With his throttle stuck, he and his Skyhawk moved towards the edge of the Shangri-La’s flight deck. JJ literally stood on the brakes, tires smoking, but the Scooter with its 30,000 pounds of thrust J52 Pratt and Whitney engine continued heading towards the edge of the carrier’s flight deck! Having no time to eject, Captain McCarthy went over the deck, nose first, and then became inverted, falling canopy first towards the water. Fortunately, his right wing hit the cat walk below the flight deck and flipped his aircraft back upright. JJ’s Skyhawk then fell four stories before hitting the water. In the time the on deck emergency was made, the U.S.S. Shangri-La made a hard turn to starboard so the ship’s propellers didn’t impact the floating Skyhawk. With the Skyhawk momentarily floating on the water, John ejected the canopy, unstrapped, and tried to climb out. He got about half way out and felt a tug on his helmet. JJ quickly realized that as his A-4 began to sink, so did he! He immediately figured out that his oxygen mask, designed to break away during a normal ejection seat sequence, did not break away, and was pulling him down. Captain McCarthy dove under the water, disconnected his oxygen mask, and resurfaced. He was recovered by the carrier’s rescue helicopter. The pilot of the rescue helicopter told JJ later that he and his crew thought he was crazy and had an unnatural connection to his aircraft when they saw him diving back down to his sinking A-4. Captain McCarthy was examined by the ship’s doctor, given some medicinal “medication” and put on the flight schedule the next day. According to McCarthy, “in those days, they had the theory of getting back in the saddle (very quickly) when you have been thrown off the horse.” A post accident investigation discovered that faulty wiring with the Bull Pup missile system caused the throttle to lock in the “full” position. 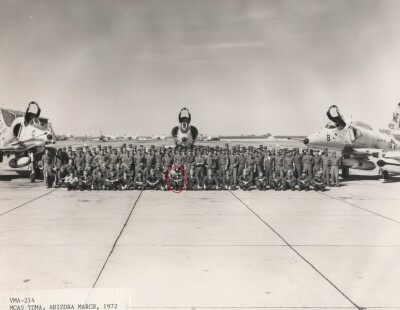 In May 1962, John returned to Marine Corps Air Station Cherry Point, North Carolina and was soon off to his next assignment – Aeronautical Accident Investigations at University Southern California. After graduating from USC in 1962, Captain McCarthy was assigned as a Flight Instructor for VT-21 at Naval Air Station Kingsville, Texas. Instructing new Navy and Marine Corps aviators, he again flew the F9F-8T Cougar. In addition to flight training, Captain McCarthy conducted field carrier landings for his students, preparing them for their “first trip to the boat.” John trained countless new pilots in his almost three year tour at VT-21. 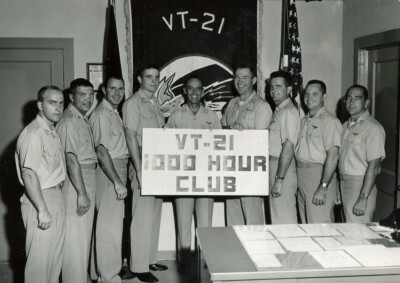 VT-21 “1,000 Hour Safety Award” at Naval Air Station Kingsville, Texas in 1962 (Capt McCarthy is third form the right)..
Captain McCarthy was also involved in the historic landing of a Marine Corps C-130 on the U.S.S. Forrestal on October 30, 1963. Months before the historic landing, John conducted Field Carrier Land Practice (FCLP) with the Marine Corps C-130 aircrew at Bouge Field (a.k.a .Bouge Marine Corps Auxiliary Landing Field). Captain McCarthy spoke rather matter-of-factly saying with the right glide slope and airspeed, landing a C-130 on a carrier was relatively straight forward. 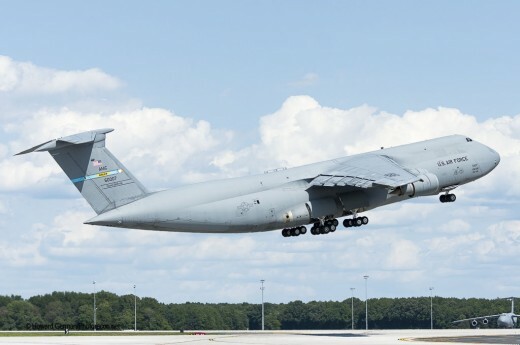 To date, this C-130 is the largest aircraft flown aboard and to take off from an aircraft carrier. 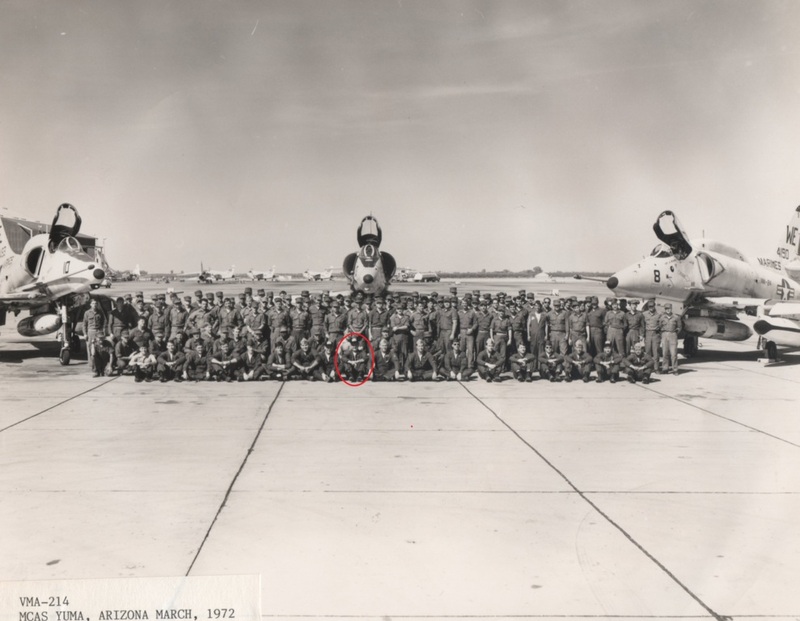 Returning to Marine Corps Air Station El Toro in 1964, Captain McCarthy was assigned to MABS-13 (a utility/logistics squadron) serving as the squadron’s executive officer. In the latter part of 1964, Captain John Joseph McCarthy deployed to Vietnam for his first combat tour. 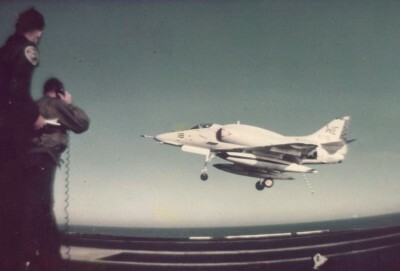 He was assigned to VMA-211 – Wake Island Avengers flying the A-4 Skyhawk. When he arrived in Japan, while on his way to Vietnam, McCarthy was promoted to Major. When Major McCarthy arrived at Chu-Lai, Vietnam as part of the 1st Marine Aircraft Wing, he soon began flying combat missions over Vietnam. Maj McCarthy sits in his VMA-211 “Scooter” in an aircraft revetment at Chu-Lai during his 1st combat tour (1965). 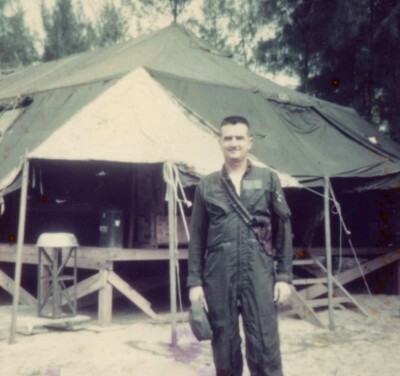 JJ’s “hooch” at Chu-Lai (1965). I asked JJ what his first combat mission was like. He told me that it was just like training, except that people were trying to kill you! McCarthy further explained that he never worried about getting “hit” and he knew it would always be the “other guy.” As JJ said, “if you worried about getting shot at and/or down, you wouldn’t have been able to focus on your mission!” He added that the Skyhawk was an incredibly durable aircraft that was very well suited for the CAS mission. Of all the weapons Major McCarthy deployed in combat (Zuni rockets, Bull Pup missiles, 20mm cannon, and/or iron bombs) he said he preferred the 20mm cannon for CAS missions because of its accuracy and devastating impact. “Give me gun pods and I’ll ruin anything” was McCarthy’s motto in Vietnam. John told me a story about why he didn’t like the Zuni rocket. The Zuni rocket was a five inch diameter unguided rocket fired from a rocket pod. While flying one combat mission; he was armed with Zuni rockets. When he rolled in on his target, he planned to fire a small salvo of Zunis. When he pulled the trigger, all 60 of his Zunis, fired at once. In less than 5 seconds he was “Winchester” (an aviator’s term for being out of ammunition and/or bombs) and had to return to base. 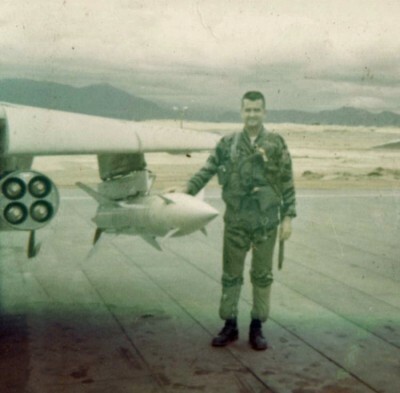 Before a combat mission, McCarthy poses in front of his A-4 fully armed with Zuni rockets and Bullpup missiles (1965). On his first combat tour, Major McCarthy flew 180 combat missions over the skies of Vietnam in his now, combat proven, A-4. It was during his combat tour and three days before he rotated home, that Major McCarthy was hit in his right wing with a .50 caliber anti-aircraft round while on a close air support mission. According to McCarthy, the .50 caliber round put a softball size hole through right wing spar and “the wing should have fell off.” If that wasn’t enough drama for one day’s work, when JJ landed at Chu-Lai, the engine on his A-4 flamed out, and he rolled to the end of the runway with less than fumes left! Amazingly enough this was the only hit he took in an aircraft during his 300 plus combat missions in Vietnam. With his first combat tour now under his belt, Major McCarthy returned home and was subsequently assigned to Naval Air Station Floyd Bennet, New York Marine Air Reserve Training Detachment (MARTD) in 1966. There, JJ had several different responsibilities including Operations Officer, Safety Officer, Engineering Officer, and Maintenance Officer of two A-4 squadrons and two helicopter squadrons. While at MARTD, JJ’s responsibility was to make “casualty calls.” Casualty calls were when John and his Sergeant had to notify families of Marines killed in the line of duty. Major McCarthy was making 30+ death notifications per month. Hating making death notifications almost on a daily basis, he had only one option if he wanted to cut his assignment short. That option was to return to Vietnam for a second combat deployment. In 1968, Major McCarthy, set sail for his second combat tour to Vietnam. When he arrived in Japan, he was promoted to Lieutenant Colonel. He was again assigned to the 1st Marine Aircraft Wing at Chu-Lai. There Lieutenant Colonel JJ McCarthy was the Commanding Officer of H and MS-12. Ironically, this was a “non flying” command but it was on this combat deployment that Lieutenant Colonel McCarthy was awarded the Distinguished Flying Cross and a Bronze Star. 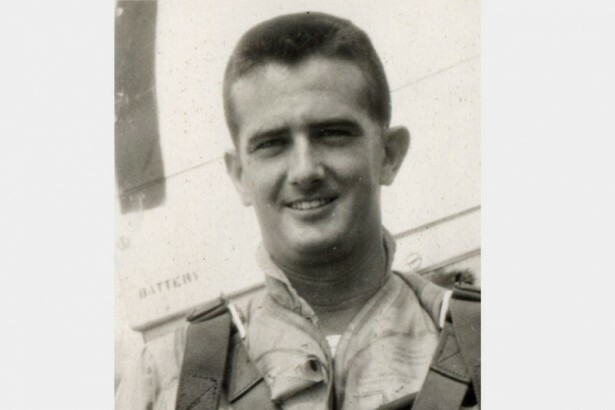 On March 4, 1969, Lieutenant Colonel McCarthy launched as a wingman in a flight of two A-4 Skyhawks assigned a CAS mission in support of Marines who were heavily engaged with the large enemy force in a village on the banks of the Tinh Yen River north of An Hoa. The Marine ground force was pinned down, receiving heavy weapons fire (including rocket propelled grenades), and had sustained casualties. John and his flight leader first made single bomb runs and then 20mm gun runs once their bombs were gone. On each bomb run and 20mm gun pass, JJ and his wingman received heavy .50 caliber machine gun fire. As a result of his actions on March 4, 1969, he was awarded the Distinguished Flying Cross (DFC). According to the DFC citation, Lieutenant Colonel McCarthy was courageous, demonstrated superior airmanship, and showed an unwavering devotion to duty in the face of great personal danger. 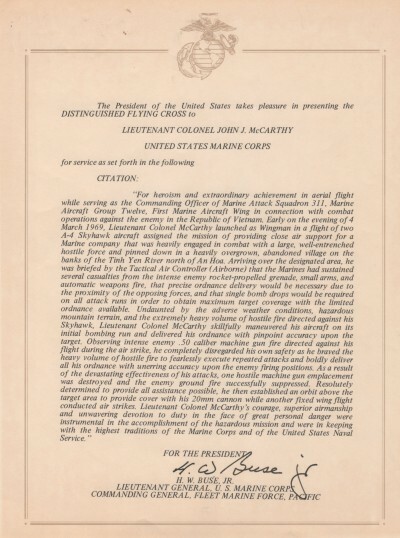 Lt Col McCarthy’s Distinguished Flying Cross citation for his action during a CAS mission on March 4, 1969. In 1969, Lieutenant Colonel McCarthy, returned home after flying 130 combat missions over Vietnam. His next assignment was the Wing Training Officer for the 3rd Marine Aircraft Wing at Marine Corps Air Station El Toro, California until 1971. 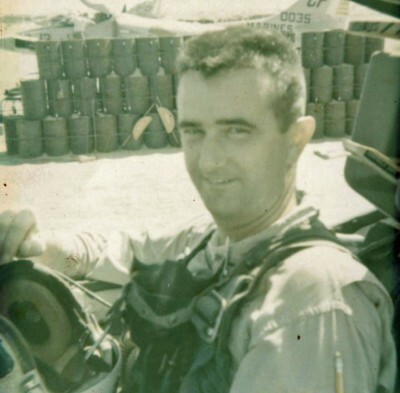 Lieutenant Colonel John McCarthy received what would be his final command on June 5, 1971 – Commanding Officer of the legendary VMA-214 Black Sheep. John accepted his command at Marine Corp Air Station Yuma, Arizona and then the squadron returned to Marine Corp Air Station El Toro. JJ served as the skipper of VMA-214 until August 15, 1972. VMA-214 Blacksheep squadron photo MCAS Yuma in March 1972. JJ coming aboard the U.S.S. Hancock(October/November 1971). McCarthy “traps” on the U.S.S. Hancock (October/November 1971). I asked Lieutenant Colonel McCarthy what it was like becoming the Commanding Officer of this legendary squadron. JJ told me that other than it being his first attack squadron to command, the squadron was just like the others, although it did have a famous past and was commanded by a Medal of Honor recipient Pappy Boyington. McCarthy did meet Boyington during his career and found him more quiet than expected. From 1972 through 1975, Lieutenant Colonel McCarthy served as the Navy’s Western Area Regional Air Space Officer stationed in the Federal Aviation Administration office in Los Angeles, California. After 29 years of service, 2 combat tours, 310 combat missions over the skies of Vietnam, 3,500 flight hours, a Distinguished Fly Cross, a Bronze Star, and 19 air medals, on August 1, 1975, Lieutenant Colonel John Joseph “JJ” McCarthy (call sign “Maureen 6” – wife’s name Maureen and they had six children) retired from the United States Marine Corps. A special thanks to Lieutenant Colonel John McCarthy for sharing his incredible story and photographs spanning his 29 year career and his son, Paul (a police helicopter pilot in Orange County, CA) for granting me access to his father and making this story possible. 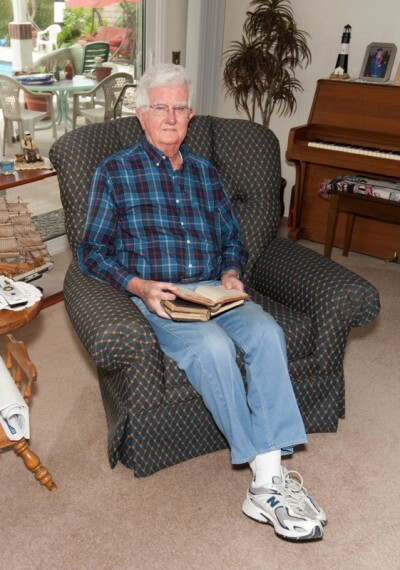 John McCarthy at home reviewing his log books that reflect his incredible USMC aviation career.